Introducing the Premier Detox Juice in Australia! Your body deserves the best quality, pure, nutrient dense and delicious antioxidant juices and superfoods. If you already enjoy classic antioxidant rich beverages such as green tea and juices including pomegranate, mixed berry, tomato, açai berry, mangosteen and other fruits, you’ll know just how simple and delicious getting your daily dose of antioxidants through juice can be. However, for lovers of fine health foods and organic juice in Australia, there’s now an even more nutritious and delicious option! We’re proud to introduce aronia berries, one of the world’s most potent sources of bioavailable antioxidants. Organic aronia berries, which are farmed in Europe, have a significantly higher antioxidant capacity (ORAC score) than even elderberries and wild blueberries. In fact, they have around four times the ORAC of goji berries! They’re not just highly nutritious, they have a uniquely crisp and refreshing flavour. At Aronia for Life, we stock a select range of aronia products including organic cold pressed aronia berry juice. Each 500mL bottle lasts well when kept in the fridge after opening. Simply add a little to each juice blend you make, mix in with bircher, dilute with water, or enjoy it any other way you enjoy regular antioxidant juices. Bulk discounts are available for purchases of 6 bottles or 12 bottles – check our 'Products' page for details. 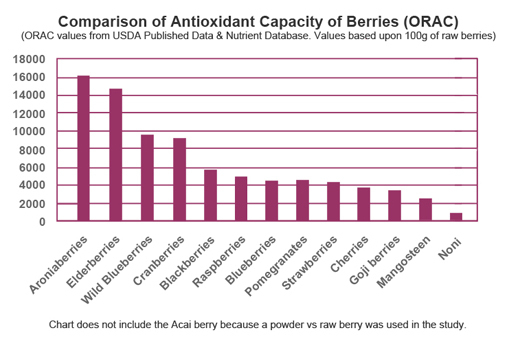 We invite you to read more about the benefits of this amazing berry on the ‘Clinical Trials’ page. For more information, please feel free to contact Aronia for Life via our 'Contact' page.